Quite glad that I went out today as MaryLynn and I chased a couple of strong supercells through the rolling hills and trees that is southwest WI.It ended up being a surprisingly good day, all things considering.Upon leaving Burnsville, our course of action took us to Rochester, MN where we waited for initiation as a mesoscale discussion had been issued, talking about the development of supercells with primarily a damaging wind and large hail threat as well as an isolated tornado or two.A severe thunderstorm watch was then issued for all of southeast MN and most of south-central WI into northeast IA.Thunderstorms had already developed across the border right on the warm front into WI and, realizing the trough and associated wind shift were passing to our east, we decided to head east on I-90 towards La Crosse, WI.Storms in WI continued to get their act together and become severe, showing signs of strong rotation as we made it through La Crosse and towards Sparta, WI where we came upon the first storm of the day.This storm was still exhibiting strong signs of rotation and here is where we witnessed the first wall cloud, and a large wall cloud it was, although quite ragged.As the storm passed south of the Interstate near Sparta, we pursued on Hwy 71.This is where the VIL’s spiked and the storm started to have a couplet.We got directly out ahead of the wall cloud at this point as the motion started to greatly increase and inflow winds became stronger, also while we encountered some dime sized hail.I was rather nervous at this point being directly out ahead of the rapidly rotating wall cloud with the storm having a TVS signature on radar but, surprisingly, the storm never produced a funnel through the entire time we were watching, just outside the town of Norwalk, WI. We continued south on County Road T ahead of the storm as different storm became tornado warned 35 miles to our southwest.This was the storm that dropped a confirmed tornado in southwest WI today.We were not able to get to this storm due to the bad road network and the likelihood that we would have to core punch the storm to have any chance of seeing anything.Therefore we stayed on our storm to the north and this storm ended up becoming tornado warned as we were witnessing another developing wall cloud, although short lived.Near Hillsboro, WI is when the chase ended as the storms congealed into a big HP mess. Back edge of rain shaft on a storm in La Crosse, WI.We had to punch this storm to get out ahead to get to the storm near Sparta, WI. Large wall cloud on the storm near Sparta, WI. This storm was severe warned for large hail and damaging winds at this time. Screen shot of the velocity imagery at the time we were approaching this storm near Sparta, WI. 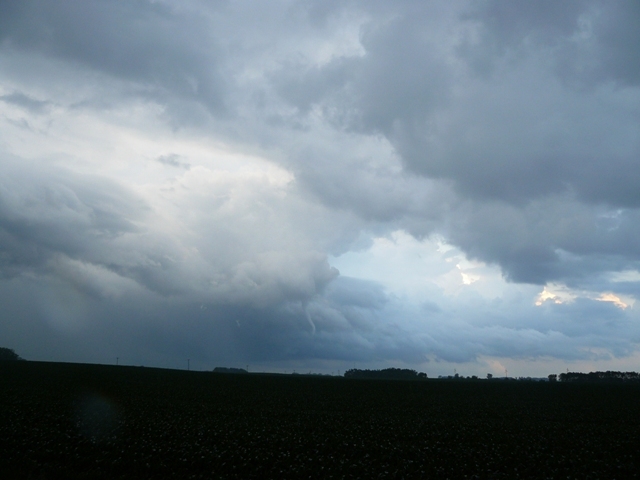 Image of inflow into wall cloud from right to left. Hail/rain core is on the left side of the image. Velocity imagery near the time we had the strong rotation very close to us in the video. Wall cloud near Hillsboro, WI shortly before the storm became tornado warned. Anvil of supercell on I-90 near New Lisbon, WI as we got back on the interstate to head home. Sunset near St Charles, MN on the drive home with towers going up close to the Twin Cities. I went with Donya Gjerdingen to southern Minnesota to get out ahead of an quickly approaching severe thunderstorms with a massive shelf cloud. We left Northfield, Minnesota and drove down to east of Faribault, Minnesota on Highway 60 near the eastern shore of Cannon Lake. Here, the storm approached us with a nice looking shelf cloud but was weakening and tending to fall apart as the gust front outran the main precipitation core. We left this area and went further south to the Hope, Minnesota exit where the gust front and shelf cloud overtook us with winds only around 40 mph as the line continued to weaken. Overall, not a great chase by any means but it was close and nice to see a decent shelf cloud, which I have not seen very many of so far this year. Shelf cloud about to overtake Owatonna, Minnesota near Cabela's. Notice the smoke from a fire rising up into the storm. A lot of dust being blown around as the gust front approaches. Dirt and dust was very thick and limiting the visibility as a result. Underneath the shelf cloud after the feature overtook us. Still windy as you can see the grass bent over in the ditch. I chased with Twister Sister Peggy Willenberg today and we ended up targeting near the Mankato/New Ulm, Minnesota area for initiation.An intense supercell that later spawned the Austin, MN tornado quickly developed 25 miles southeast of Mankato and we were quickly on this storm near Geneva, MN.There was a large wall cloud on the storm that was being shielded somewhat from the intense hail core but we could see the edge upon following the storm to the east to Highway 218.Upon briefly getting cored with some nickel sized hail, we emerged very close to the meso, which was violently rotating on the northwest side of Austin and very low to ground.Under the meso, there was no condensation funnel at that time, but there was debris underneath the meso, so this was indeed the first touchdown of the tornado at that time.We then progressed south towards I-90 and came upon damage to structures, trees and downed power lines as well as snapped power poles.After getting through Austin and emerging on the southeast side of town, a newly developed mesocyclone let to a second touchdown, and much stronger, about 2 miles east-southeast of Austin.This tornado was much larger and had multiple vortices as shown by the video.This was quite the incredible but sobering experience at this point as the tornado sat over a farmstead and large wooded grove of trees for around 4-5 minutes about ¼ mile to our south-southeast.There was large structural damage done here as well as numerous power flashes with this tornado upon meandering slowly to the northeast.We also got into some golf ball sized hail at this point that did put a crack in the windshield.The tornado eventually diminished but soon cycled, with a third touchdown of the tornado as we traveled southeast on Highway 56 near Rose Creek, MN. This tornado was a nice cone structure with a needle towards the ground and intense rotation about ½-1 mile away from us at that point.It did not appear that this third touchdown led to much in the way of damage, thankfully.Thereafter, we followed the storm further southeast towards Adams and Leroy, MN, witnessing a pair of horizontal funnels (very cool looking I might add) as well as an organized and rotating wall cloud that did not put down a tornado before we lost daylight, although it very much looked like it would at a few points in its cycle.All in all, a terrific chase day for us, close to home, and actually too close to home for me considering I grew up in this area and knew a lot of the areas that were hardest hit by these tornadoes. 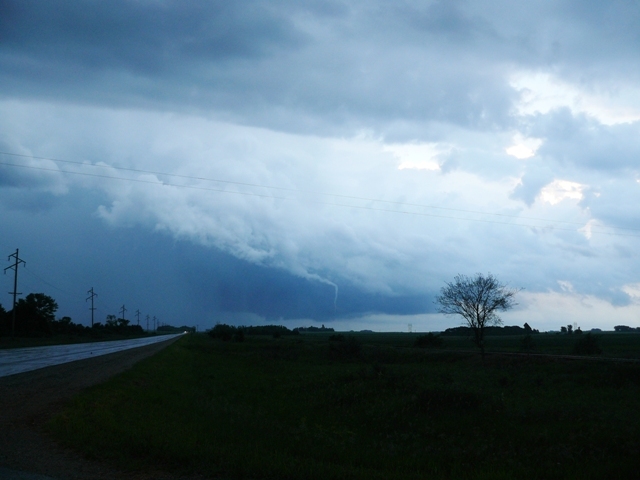 Image of the supercell taken near Amboy, Minnesota. Strong thunderstorm updraft taken near New Richland, Minnesota. Tornado 1/2 mile to the east of the Austin Municipal Airport. 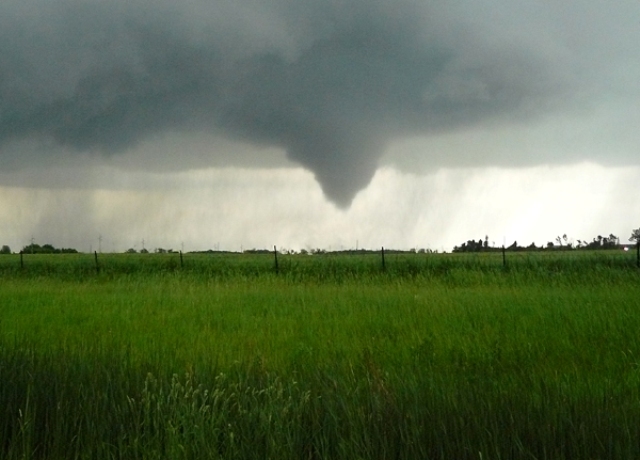 This tornado went over a farmstead and caused considerable damage to that area. Tornado 1/2 mile to the east of the Austin Municipal Airport. Condensation finally reaching the ground here. Tornado 1/2 mile east of the Austin Municipal Airport. Police on the scene at the farmstead to the right of the tornado. 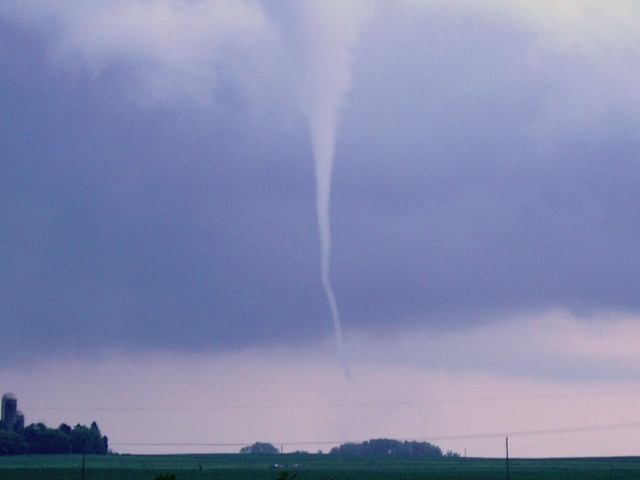 Tornado east of Austin, Minnesota. Large wall cloud over the tornado as well. Tornado 1 mile to the south of Rose Creek, Minnesota. Final tornado of the day with this amazing storm. Not a great day overall with rather weak shear and a cap till later in the day when storms were able to bust through.Models were consistently forecasting over near 5000 j/kg for the late afternoon and a non-capped atmosphere with precipitation breaking out in all the main model solutions. However, this was a cold front situation with weak southerly inflow winds resulting in not as favorable shear profiles as one would hope. Also, another limiting factor was the weak upper level support and really little to no jet support. All in all, not a great day but it was nice to see some severe storms and a few wall clouds. We started the day in Davis, OK and sat around in a church parking lot till 5pm when things really started to get going. We first went to check out the initially developing storms to the north of Ada. 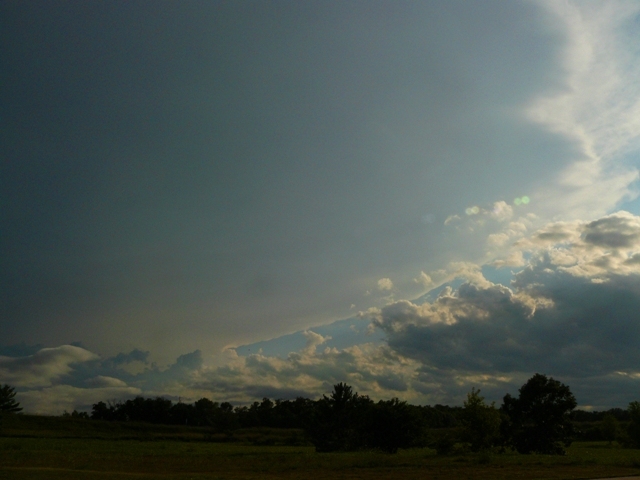 These storms had skinny updrafts and were not all that impressive, but had some decent updraft bases nonetheless. Not liking the overall look of these storms, we doubled back down to near Davis where some more impressive cells were going up to the west of I-35.These storms quickly had shear and hail markers and quickly became supercellular with severe thunderstorm warnings issued by the NWS. We did take a few wall cloud pictures and some storm structure. A better storm soon developed to the east of Wichita Falls, TX, just to the south of the Red River. We bailed on the northern storms and shot down I-35 to Gainesville, TX and then west on Hwy 82 to near St Jo, TX. As we approached this storm, it was after sundown and starting to get really dark, but it did become tornado warned with radar certainly indicating some strong rotation and an impressive hook. I tried to shoot some lightning pics here but there was just not enough to get some decent pictures and we could not see under the base at that point to see if there was any sort of lowering. After that, my wife and I drove through the night to get back to Burnsville before noon the next day. We made it in 11 hours, but I wouldn’t recommend doing it after chasing that day. What an incredibly long drive! But with 2 drivers, it was doable. In Oklahoma, we noticed a sign for Minnesota Road! Non-rotating wall cloud on our first storm of the day near Ada, Oklahoma. Image of a wall cloud and inflow on a supercell near Davis, Oklahoma. Thunderstorms developing in the distance at sunset.